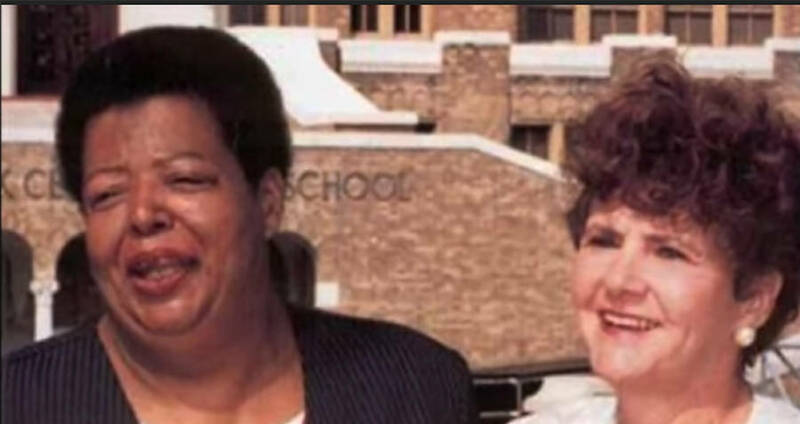 The photo of Hazel Bryan screaming at Elizabeth Eckford is jarring enough, but the story of their subsequent reconciliation and friendship is just as fascinating. Bettmann/Getty ImagesElizabeth Eckford walking to Little Rock Central High School. Hazel Bryan stands behind her screaming. It’s an iconic image of the American civil rights movement, one that’s been reprinted in newspapers and history books over the last fifty years. 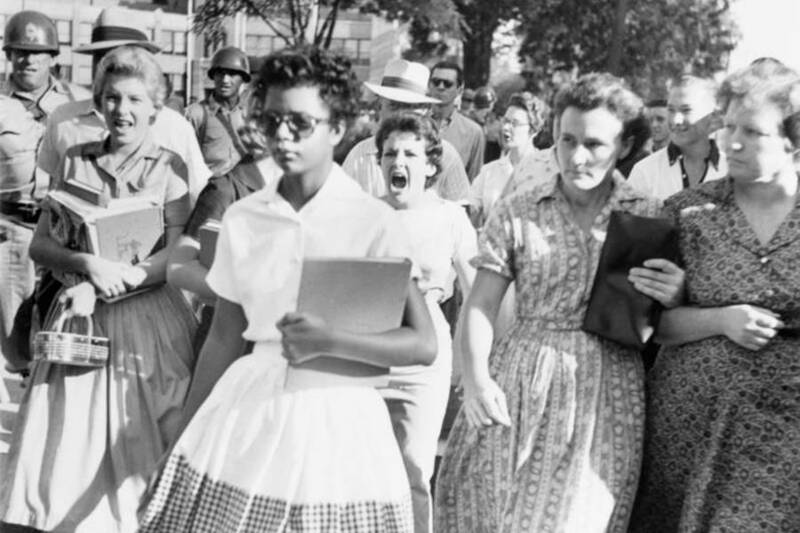 In the forefront, a 15-year-old girl named Elizabeth Eckford is being hurled insults at by a white mob behind her as she is denied entrance to the school. Just behind her, also 15 years old, was another young woman whose face is contorted with anger. That young woman’s name was Hazel Bryan, and her face became the face that symbolized segregation in the southern United States. On the morning of September 4, 1957, Eckford was to join eight other students – a group that was later to be known as the Little Rock Nine – to become the first black students to enroll at the all-white Little Rock Central High School. Because she did not have a phone in her home, Eckford never received a call from Daisy Bates, the head of the Arkansas chapter of the NAACP, telling the students to come to her house prior to heading to the school. So that morning, Eckford went directly to the school alone. 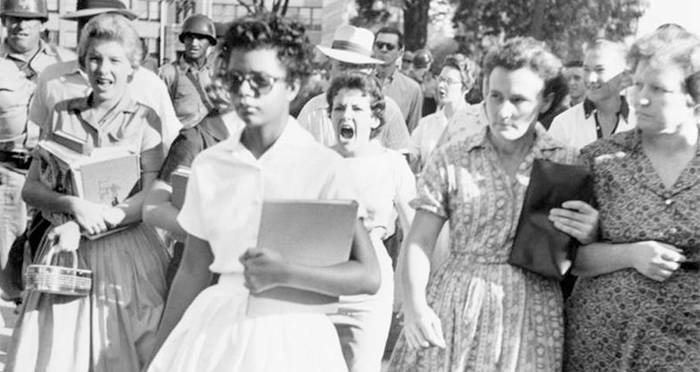 Once there, she encountered the screaming mob of white people and the Arkansas National Guard, set in place by Governor Orval Faubus to prevent the black students from entering the school. When the rest of the group arrived, they, too, were all turned away from the school. Finally, on September 24, President Eisenhower sent in the 101st Airborne Division of the United States Army to accompany them inside the building and the nine students were formally able to begin attending classes. Hazel Bryan’s parents pulled her from the newly integrated Central High School and instead enrolled her in a rural school closer to her home. However, she dropped out a year later to get married. The picture had almost immediately become a notorious symbol of white hatred that followed both Eckford and Bryan throughout their lives. Bryan, however, had undergone an intellectual awaking after high school, in large part due to watching the struggle of Martin Luther King and the other civil rights protesters on television. She was remorseful over the way she had treated Eckford and was haunted by the fact that her children would one day see her in that infamous photo. In 1963, she tracked down Elizabeth Eckford and called her to apologize for her behavior six years earlier. Eckford accepted her apology, but the conversation was short and the two did not talk again for years. YouTubeElizabeth Eckford and Hazel Bryan reunited at the 40th anniversary of the Little Rock Nine. Eckford suffered from depression throughout her life and she had various stints in college and then the Army. She was stationed at bases around the country, from Indiana to Georgia to Alabama, before she finally returned to Little Rock in 1974. She returned to the same home she grew up in where she raised two sons alone and largely surviving on disability checks. She never married. Both Eckford and Bryan lived relatively quiet lives, with Eckford giving the occasional interview but largely opting out of the spotlight as a member of the Little Rock Nine. Over the years, Bryan had worked to make up for her past behavior, becoming involved with organizations that helped minority students and unwed mothers. The year 1997 marked the 40th anniversary of the integration of Little Rock Central High School and then-president and Arkansas native, Bill Clinton, wanted a large ceremony to commemorate the event. Will Counts, the photographer responsible for the famous photo, asked Eckford and Bryan if they would be willing to pose again for a second photograph and they both agreed. Reconciled after forty years, the two realized they had lots in common, including their children and a fondness for flowers and thrift stores. They struck up a very unlikely friendship, and began attending events together, and touring around schools to talk to children about race and tolerance. Both received criticism for their relationship. Eckford was accused of being naïve or too forgiving, while Bryan was accused of being a phony opportunist. She especially received criticism from whites who resented her being the face of reconciliation after all those years being the face of segregation. Their relationship was strained for other reasons, too. Eckford believed Bryan didn’t own up to her past as well as she should have, and began to suspect she was too much of an attention-seeker. The two were never able to mend the tension and their friendship sadly went downhill. Next, read about the history behind the iconic “Saigon Execution” photo. Then, check out the epic story behind the iconic photo of Elvis shaking hands with President Richard Nixon.